Summer Grub: Watermelon Gazpacho, What Else? Are you on a quest for a spectacular gazpacho recipe? Quest no more, the recipe is right here. X marks the spot. I will always remember my first Gazpacho experience. I was in Barcelona during the torrid month of July and was living life at a laid-back pace – “Vicky Christina Barcelona” style. Endless sunshine, unbeatable food (I was in food discovery nirvana), amazing cultural discoveries, practicing my self-taught Spanish (hello romantic language), soaking up the sun’s love and admiring surreal gothic and neo-gothic architecture sums up my whole entire experience. An especially fond memory I have of Barca was falling in love with the fresh and local fruits and vegetables found at Las Ramblas open-air market (La Boqueria) and laying my taste buds upon fresh smoothies, fresh baked goods and experiencing new flavour combinations. Spaniards sure know how to eat! Plus, it seems like Barcelonians (?) are always stopping for a bite – which I think is A-OK/where do I sign up? I remember walking into a Spanish grocery store and spotting a litre container of Tropicana Gazpacho. Puzzled and having never heard of this “sopa”, my curiosity got the best of me and I bought it. Within the following hour, it had all been guzzled down and left a favourable impression on me. Everything that is comprised in a gazpacho is refreshing and hydrating. Why is this important? Because when the mercury soars, our water needs too soar. Water represents about 65% of our weight, 85% of our blood and 75% of our brains and muscles. 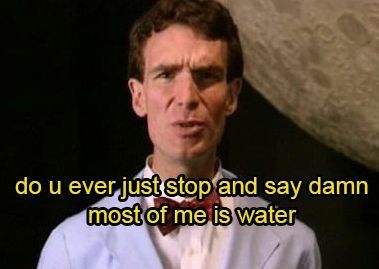 We can always count on Bill Nye for some wisdom. To calculate your fluid need in milliliters, take your weight in kg (which is your weight in lbs divided by 2.2) and multiply it by 30. Example: If you weigh 150 lbs (68 kg), your fluid need is 2040 ml of fluid per day. People often mistakingly think that they would thus need 2 litres of water per day when really they need 2 litres of fluid per day. At least half of your fluid need should be met via drinking water but the other half of your fluid need can come from other liquids such as milk and alternatives, soups, fruits, vegetables, teas, tisanes, etc. Moral of the sentence: you can EAT your water 🙂 . In fact, according to the Institute of Medicine, 20% of an individual’s water intake tends to come from fresh produce such as lettuce, zucchini, berries, melons, etc. Because cucumber is made up of 96% water, tomatoes are 94% water and watermelon is 92% water, this soup is a keeper. Whoever said “Hell no H20!” was wrooooooong (I’m talking to you Piper Perado). Gazpacho is the perfect hot-weather soup. 2. 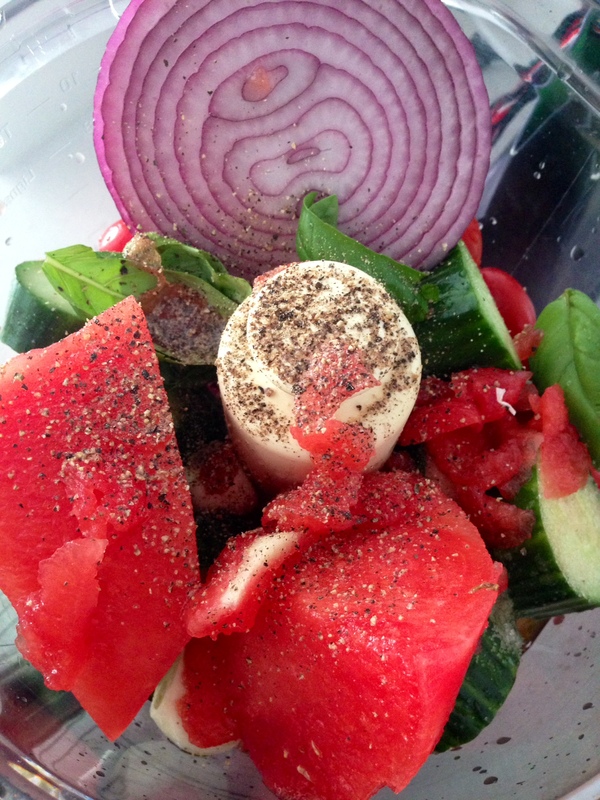 Place all ingredients in a food processor, blend and watch your tasty gazpacho be born. 3. Serve with a drizzle of olive oil or topped with some crisp croutons. These summer eats can also be spiced up with leafy herbs such as parsley and cilantro. The ball is in your court 😉 . N.B. Traditionally, gazpacho was made by pounding the vegetables with a mortar and pestle, which helps avoid the foaming that occurs when a food processor is used. If you are in a laborious mood, you may wish to honour this tradition, which will also leave you with a chunkier version.